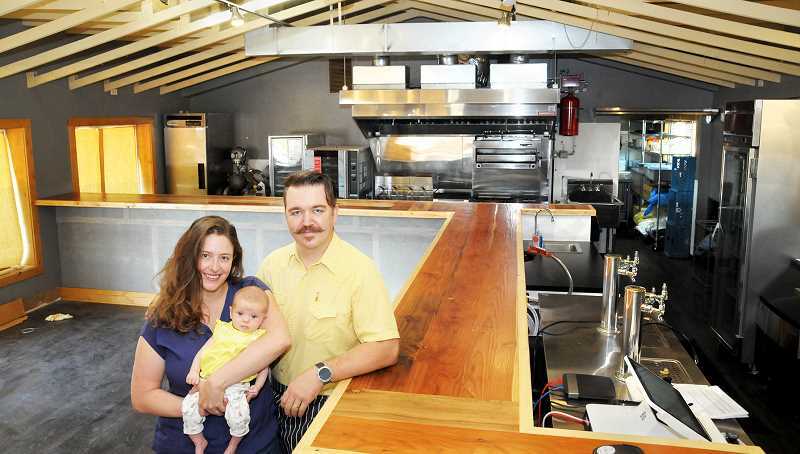 Sean and Noelle McKee own a catering company called Flavor Memories and it is through that venture that the couple came to form The Newbergundian Bistro, which is taking up residence in the Villa Road building that formerly held Bert's Chuckwagon, which closed March 15. Sean McKee received his training in France and has been a chef for 18 years. Noelle McKee has been in the restaurant business for more than two decades. "Combined we have 40 years of experience," Sean McKee said. "We are here to share and grow a community here in Newberg," Noelle McKee added. "We love what we do and we have been doing it for a long time. It's wonderful to be able to do this together." The couples refers to their food as French-inspired American and features hamburgers, salads, fish and chips and a few things with a European influence. Sean will be the chef, while Noelle tends to the rest of the store. "We want to take the time to follow our ingredients and how they are sourced with stuff that lasts," Sean McKee said. "I've been buying products from some of our sources for years and years and I know they take the time to make sure that the quality of the ingredients and how they are sourced (is right). It translates directly to the plate and you can taste things that are made with love or without love." Remodeling of the interior of the bistro has begun and the kitchen will be upgraded. They will serve wine, beer and kombucha on tap and have added a deli counter for quick food pick-up. They have also installed a beverage cooler in the restaurant in case someone needs to buy something on the fly. "We will have rotating specials, so there will be a fresh fish special, steak special, rotating soups every day and appetizer specials," Sean McKee said. "We will have specials to highlight in seasonal foods and the things that we do really well." "We want to have approachable price points, make it easy for younger people or anyone on a budget and not break the bank and go home satisfied," Noelle McKee added. As for the ambiance, the floor has been replaced with a light gray hardwood and a chef's counter has been installed in order watch Sean McKee wiz around in the kitchen while whipping up his favorite dishes. Old-time iron clad stools and chairs provide a bistro atmosphere and there will be a place to sit outside on nice days. "We want to make it family friendly and affordable so everyone can come in and enjoy our food," Noelle McKee said. "It is really nice to be able to share our story with food and beverage and to share in the community and take the food and beverages that we love into Newberg." The couple has begun hiring staff and expect to open in July. "We would like people to come and check out the space and get acquainted with us," Sean McKee said.